See also: Company Shops; Norfolk Southern Railroad; Western North Carolina Railroad. The North Carolina Railroad (NCRR), under lease since 1999 to the Norfolk Southern Corporation, was chartered in 1849 and completed in 1856 from Goldsboro through Raleigh, Greensboro, and Salisbury to Charlotte, a distance of 223 miles. The railroad was largely responsible for the Piedmont Urban Crescent that developed along its route, contributing to the growth of its towns and bringing into existence others, including Durham, Burlington (originally Company Shops, the site of its repair shops from the 1850s to the 1870s), High Point (at the road's highest elevation), and Thomasville. The NCRR was for many years the longest railroad and the largest corporation in North Carolina. Since the state heavily subsidized its construction, receiving three-fourths of its stock in return, the NCRR was also for a time the state's largest single source of revenue. A state proxy appointed by the governor continues to vote that stock and the governor appoints two-thirds of the board of directors. The NCRR was intended to be the centerpiece of an east-west rail line linking the state's seaports with the mountains and, through other rail connections, with a point on the Pacific Coast. To that end, the Atlantic & North Carolina and Western North Carolina Railroads were built a few years later, running east from Goldsboro and west from Salisbury, respectively. From the beginning, however, the main flow of rail traffic ran north and south, not east and west. Thus the NCRR became a vital link in one of the main north-south trunk lines connecting the urban Northeast with the Deep South. Its immediate connection to the south (albeit with a gauge difference that required unloading and reloading every train) was the Charlotte & South Carolina Railroad; to the north its connections were the Raleigh & Gaston at Raleigh and the Wilmington & Weldon at Goldsboro-both of which ran north to Weldon, where they connected with railroads into Virginia. In 1864, under wartime duress, a more direct northern connector, the Piedmont Railroad, was built from Greensboro to Danville, Va., where it met the Richmond & Danville Railroad. The NCRR played a vital, if precarious, role in supporting the Confederacy in Virginia. This was especially true toward the end of the Civil War, when it was part of the only line left open to connect the Lower South with Gen. Robert E. Lee's army and the Confederate government at Richmond. In 1871 the NCRR fell prey to the consolidation movement then forging a national rail network out of the local and regional lines that marked the early years of railroading. Leased for 30 years to the Richmond & Danville (itself under northern control by then), the NCRR was leased again in 1895 to J. P. Morgan's new Southern Railway (now the Norfolk Southern). In 1989 the road gained an additional 94 miles from Goldsboro to Morehead City by absorbing the similarly state-controlled Atlantic & North Carolina Railroad. In 1998 the state of North Carolina bought all remaining private shares of the company's stock and the following year reached an agreement with Norfolk Southern allowing that line exclusive maintenance and freight operations on the NCRR line, now totaling 317 miles, for 15 years. Millions of dollars continue to be spent upgrading the line; in 2001, $10 million worth of improvements to the corridor between Goldsboro and Morehead City were completed, followed by repair work on the Neuse River Bridge in Kinston. In addition to freight trains operated by the Norfolk Southern, in the early 2000s Amtrak ran two passenger trains, the Piedmont and the Carolinian, along the NCRR corridor; CSX used a small portion of the route. Plans also existed for regional mass transit operations along NCRR's rails in Charlotte, the Triangle area (Raleigh, Durham, and Chapel Hill), and the Triad (Winston-Salem, Greensboro, and High Point). High-speed rail transit connecting the northeastern United States with Charlotte and Atlanta was also under consideration. Cecil K. Brown, A State Movement in Railroad Development: The Story of North Carolina's First Effort to Establish an East and West Trunk Line Railroad (1928). Allen W. Trelease, The North Carolina Railroad, 1849-1871, and the Modernization of North Carolina (1991). "NCRR History." North Carolina Railroad Company. 2012. http://www.ncrr.com/about-ncrr/ncrr-history/ (accessed July 31, 2012). North Carolina Railroad Company. Proceedings of the stockholders of the North Carolina Rail Road Company. Salisbury, N.C.: Printed at the Carolina Watchman Office, 1850-1921. http://digital.ncdcr.gov/u?/p249901coll22,641431 (accessed August 16, 2012). Barringer, Rufus. History of the North Carolina Railroad. Raleigh [N.C.]: News and Observer Press. 1894. http://archive.org/stream/historyofnorthca00barr#page/n1/mode/2up (accessed July 31, 2012). Gwynn, Walter. Report of the Chief Engineer on the Survey of the N.C. Railroad, May 1851. Greensboro, N.C.: Swaim and Sherwood. 1851. http://archive.org/stream/reportofchiefeng00nort#page/n3/mode/2up (accessed July 31, 2012). Morehead, J. M. Report of the Directors of the North Carolina Rail Road Company. Raleigh [N.C.]: Thos. J. Lemay, Printer to the State. 1850. http://archive.org/stream/reportofdirector00nort#page/n1/mode/2up (accessed August 1, 2012). Graham, W.A. "North Carolina Railroad: Charter and Construction." [Raleigh, N.C.] News and Observer. May 30, 1920. http://digital.ncdcr.gov/u?/p249901coll37,17217 (accessed August 3, 2012). "Alexander New Head of N.C. Railroad." The News and Observer [Raleigh, N.C.]. July 9, 1965. "Railroads - North Carolina" Vertical Reference File, Government and Heritage Library, North Carolina. "8 Directors Named For State Railroad." The News and Observer [Raleigh, N.C.]. July 23, 1967. "Railroads - North Carolina" Vertical Reference File, Government and Heritage Library, North Carolina. Olds, Fred A. "Earlier N.C. Railroad History: The Late Capt. A. B. Andrews Had Epoch-Making Part In It." The Orphans' Friend and Masonic Journal. March 9, 1923. "Railroads - North Carolina" Vertical Reference File, Government and Heritage Library, North Carolina. McCorman, Rick. "Agreement calls for state to buy N.C. Railroad." The Carteret County News-Times. April 11, 1997. "Railroads - North Carolina" Vertical Reference File, Government and Heritage Library, North Carolina. North Carolina Railroad Company. North Carolina Railroad Company Annual Report. Raleigh, N.C.: North Carolina Railroad Company. 2002-2009. http://digital.ncdcr.gov/u?/p249901coll22,288595 (accessed August 16, 2012). 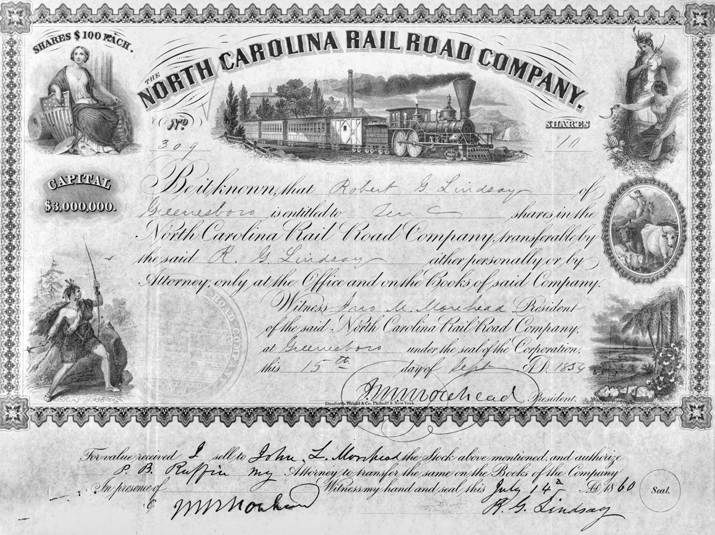 Stock certificate for the North Carolina Railroad issued in 1859 and signed by NCR president John Motley Morehead. Courtesy of North Carolina Office of Archives and History, Raleigh.